I was born in South Africa and in South Africa banana bread is very traditional. You will find it at any and every gathering where tea and coffee is served, always sliced and spread with butter. 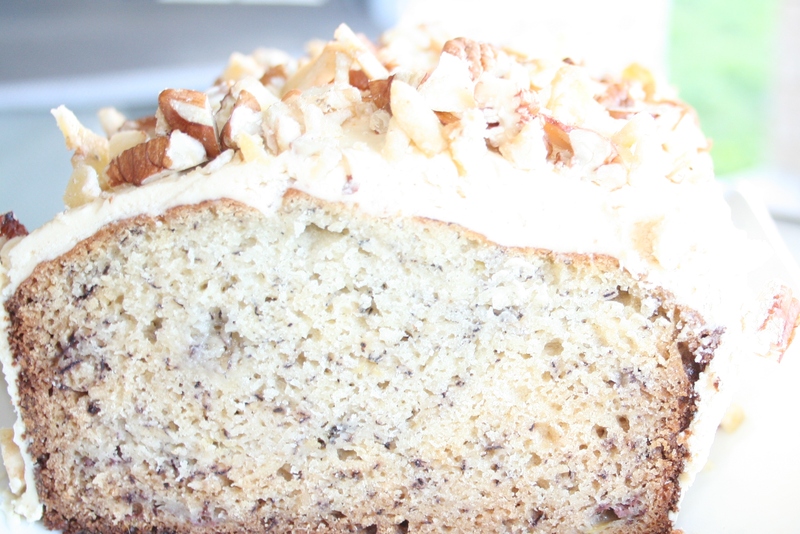 It is one of those staple tea-time treats that nobody ever messed with, apart from perhaps adding some nuts. We have a delicious family recipe, which was one of my favourite things to bake when growing up. And the few minutes we had to wait for it to cool down slightly after coming out of the oven was absolute torture. Before we could cut it, a small argument would normally ensue about who got the first slice of the crust, and often we would just cut off both ends to keep the peace. Then we would cut thick slices and spread generously with butter, the warm bread soaking it up like a sponge, and not a care in the world about calories. And one slice would quickly turn into two, sometimes three, and in no time there would be none left. On the odd occasion that we did have a little bit left, it was equally delicious cooled down, although with a slightly thinner layer of butter! Then we moved to New Zealand, and more recently to Australia, and in neither of these countries have I been able to experience banana bread in a similar way. In fact I suspect people here find it weird spreading a slice of banana bread with butter. Which is sad because they are missing out on one of life’s greatest pleasures in my opinion. But then a colleague of mine recently celebrated his birthday, and I said I will bring in any cake he wanted, and he asked for banana bread but with icing. Icing. On a banana bread. I didn’t understand. I just couldn’t help but ask “Like, on top?” “Yes, vanilla icing spread over the top”. I was still trying to compute, but it’s his birthday and that’s what he wanted. So I went home and baked our family banana bread with smells of my childhood wafting through the house. Bliss. But then I had to start making the icing, and before I could spread it on, I actually said sorry to our family banana bread for desecrating its tradition. I sprinkled some chopped nuts and banana chips over, boxed it up and took it to work the next day. He was thrilled, but I still couldn’t imagine that it would taste good. That was until he cut into it and we all had a slice, and my goodness was it good! 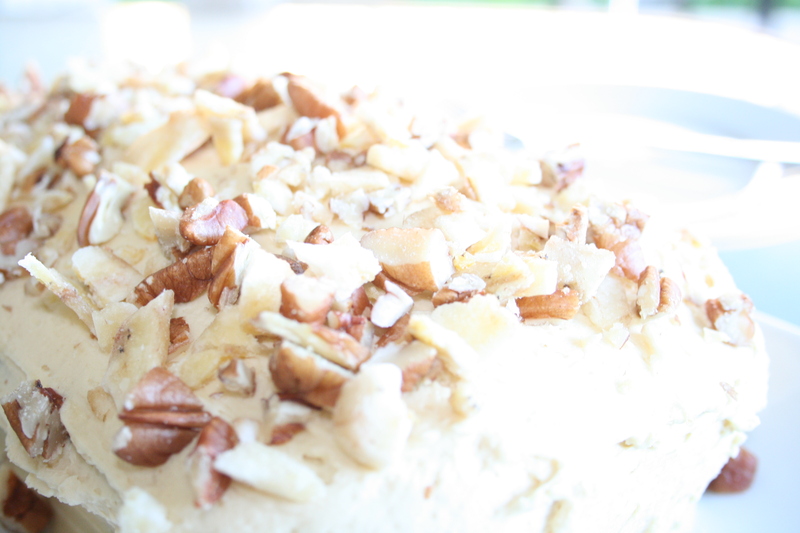 I had made a vanilla and maple syrup icing, and that combined with the pecans and banana chips tasted amazing. I dare say almost better than our traditional way. Could it perhaps be time for a new tradition…? Cream the butter and castor sugar until pale and fluffy, then add the eggs one a time beating well after each addition. Mash the bananas and stir in the lemon juice. Add this to the butter mixture and beat until the banana is incorporated. Sift the dry ingredients together and fold into the butter and banana mixture. Pour the mixture into a loaf tin and bake for 45 minutes or until a skewer comes out clean. Note: Normally this recipe will form a nice crust on the top, but because I was going to spread it with icing I didn’t want too much of a hard crust so I covered the loaf tin with foil and pricked it with a few holes to let the steam out and removed the foil in the last 5 minutes of baking. Vanilla & Maple Syrup Icing: Beat the butter and icing sugar together until white and fluffy, add the vanilla extract then the maple syrup and continue to beat until well incorporated. Because the icing has quite a high butter content I would recommend beating as long as possible, so that it gets a type of whipped consistency that will taste more creamier than buttery. When the banana bread has completely cooled down, spread the icing over the top and sprinkle with pecan nuts and banana chips. Thank you so much! It’s always nice to hear about shared experiences 🙂 Love your blog name and your blog! Very fun to hear about your traditions growing up in South Africa and a yummy new tradition! Looks delicious. 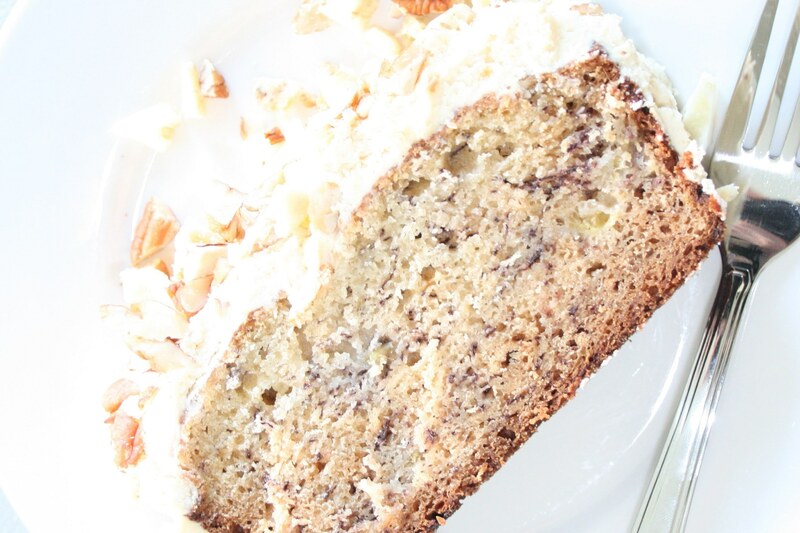 What a delicious twist to add to simple old banana bread! I really enjoy your blog, so I nominated you for a Kreativ blogger award. I love banana bread!!!! ❤ And this looks delish! !